We need to provide people with proper access, interaction, and use of technology so that it serves their needs. 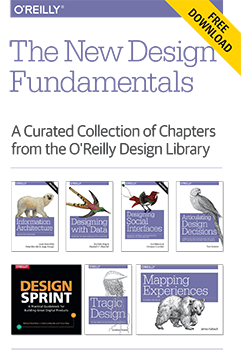 Download a free copy of “The New Design Fundamentals,” a curated collection of chapters from the O’Reilly Design library. Editor’s note: this post is an excerpt from “Tragic Design,” by Jonathan Shariat, which is included in the collection. I love technology and I love design, and I love the power they have to help people. That is why when I learned they had cost a young girl her life, it hurt me deeply and I couldn’t stop thinking about it for weeks. My wife, a nursing student, was sharing with her teacher how passionate I am about technology in health care. Her teacher rebutted, saying she thought we needed less technology in health care and shared a story that caused her to feel so strongly that way. This is the story that inspired me to write this book and I would like to share it with you. Jenny, as we will call her to protect the patient’s identity, was a young girl who was diagnosed with cancer. She was in and out of the hospital for a number of years and was finally discharged. A while later she relapsed and returned to be given a very strong chemo treating medicine. This medicine is so strong and so toxic that it requires pre-hydration and post-hydration for three days with I.V. fluid. However, after the medicine was administered, the nurses who were attending to the charting software, entering in everything required of them and making the appropriate orders, missed a very critical piece of information: Jenny was supposed to be given three days of I.V. hydration post treatment. The experienced nurses made this critical error because they were too distracted trying to figure out the software they were using. Enhance the user experience with the thoughtful use of sound. It’s definitely a fun toy to play with, but most of us probably couldn’t think of how this might be relevant to our jobs. When I presented 8-bit game music with the Web Audio API at last year’s Fluent Conference, I readily admitted that it was intended to be purely fun rather than practical. Recently I explored the idea of adding audio to web apps, but I think the big problem isn’t that web developers were unsure how to add audio to their app, but that they don’t think they should add audio to web apps. In this article, I’d like to make the case that you should be considering audio when designing your web application user interface. GM: That Car You Bought, We’re Really the Ones Who Own It — GM’s claim is all about copyright and software code, and it’s the same claim John Deere is making about their tractors. The TL;DR version of the argument goes something like this: cars work because software tells all the parts how to operate; the software that tells all the parts to operate is customized code; that code is subject to copyright; GM owns the copyright on that code and that software; a modern car cannot run without that software; it is integral to all systems; therefore, the purchase or use of that car is a licensing agreement; and since it is subject to a licensing agreement, GM is the owner and can allow/disallow certain uses or access. In the future, manufacturers own the secondary market. Architectural Robots (Robohub) — The concept is named ‘Minibuilders.’ This is a group of robots each performing a specific task. The first robot layers a 15 cm (6 in) footprint or foundation, while a second and a third robot print the rest of the building by climbing over the structures they already printed and laying more material over them. This design is only possible at construction scale where printed layers are solid enough to support a robotic print head. The Psychology of UX — digging into 10 things about human psychology that should inform UX. gigo — Fetching packages in golang can be difficult, especially when juggling multiple packages and private repositories. GIGO (Gigo Installer for Go) tries to solve that problem, effectively being the golang equivalent of Python’s pip. Google Contributor — when the web’s biggest advertiser tries alternative ways to fund web content, I’m interested. Microservices in Go — tale of rewriting a Ruby monolith as Go microservices. Interesting, though being delivered at Gophercon India suggests the ending is probably not unhappy. Watch & Wear (John Cross Neumann) — Android watch as predictor of the value and experience of an Apple Watch. I believe this is the true sweet spot for meaningful wearable experiences. Information that matters to you in the moment, but requires no intervention. Wear actually does this extremely well through Google Now. Traffic, Time to Home, Reminders, Friend’s Birthdays, and Travel Information all work beautifully. […] After some real experience with Wear, I think what is more important is to consider what Apple Watch is missing: Google Services. Google Services are a big component of what can make wearing a tiny screen on your wrist meaningful and personal. I wouldn’t be surprised after the initial wave of apps through the app store if Google Now ends up being the killer app for Apple Watch. Solving 11 Likely Problems In Your Multithreaded Code (Joe Duffy) — a good breakdown of concurrency problems, including lower-level ones than high-level languages expose. But beware. If you try this [accessing variables with synchronisation] on a misaligned memory location, or a location that isn’t naturally sized, you can encounter a read or write tearing. Tearing occurs because reading or writing such locations actually involves multiple physical memory operations. Concurrent updates can happen in between these, potentially causing the resultant value to be some blend of the before and after values. Obama Sharply Criticizes China’s Plans for New Technology Rules (Reuters) — In an interview with Reuters, Obama said he was concerned about Beijing’s plans for a far-reaching counterterrorism law that would require technology firms to hand over encryption keys, the passcodes that help protect data, and install security “backdoors” in their systems to give Chinese authorities surveillance access. Goose sauce is NOT gander sauce! NOT! Mmm, delicious spook sauce.